Also, a lot of “invisible” code improvements. Some UI to select upgrades between levels. Technical improvements – all voxels are rendered dynamically now, which is very slow. The goal of each level in LEVEL UP! is to reach the exit platform. When you do it, the platform raises your character up to the next level, and you can choose some upgrades: increase attributes, get new skills, new weapons, that kind of RPG stuff. I also plan to make levels procedurally generated, Spelunky-style. Oh, and huge bosses that you can “dig” through and destroy them from inside. This entry was posted in LEVEL UP! 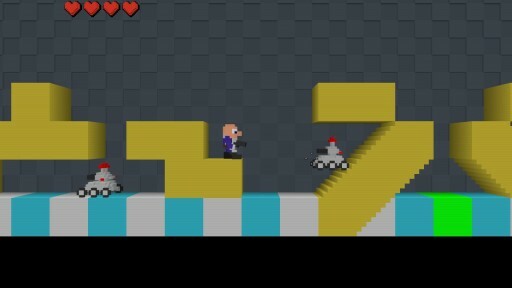 and tagged dev, LEVEL UP!, screenshots, voxels. Bookmark the permalink. Both comments and trackbacks are currently closed.